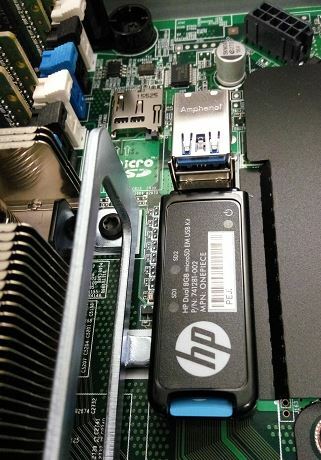 If you install ESXi on a microSD card and if you use HP Proliant Servers you may be interested in the “HP Dual 8GB MicroSD Enterprise Midline USB” (HP P/N: 741281-002). This dual-microSD card module provides data redundancy through a mirrored RAID 1 configuration. You connect the module to the internal USB port and install ESXi as usual! If one of the SD card fails, the configuration of your ESXi host is still available and functional on the second SD card. In this case just replace the module with a new one, install the surviving SD card and configure it as primary. How to install the module and VMware ESXi? Installation and configuration of the module is really easy. Plug in the microSD card module to the internal USB port and power on the server. The microSD card module is automatically configured and ready to use. How to replace a failed microSD card? remove one of the SD cards in the new module and replace it with your primary one. Please remember the slot number! Have you seen an almost 220 ms peak latency reported on the host performance overview when using the dual MicroSD? When you drill in you find it to be read latency to the HP Log File LUN (mpx.vmhba33:C0:T0:L1). I do not know why VMware would be reading this volume. What worries me mostly is this reading would make it difficult to see latency problems on other disks. I’m using ESXi 6 update 2 from the HPE April 2016 ISO. Getting a replacement USB module with two new MicroSD cards, I replaced the working MicroSD card in to new USB but powering up the server gave a black screen with red text all over (with register data listed). This was before the F9 System option was accessed. We had to replace all the MicroSD cards with the blank ones and rebuild ESXi as described earlier in the document. I have been using this HP enterprise USB device for a while in several servers and the failure rate is far bigger than single SD cards. This is the example of a good idea converted in a nightmare. Truly modest SD CARDS duplication administration does not as a matter of course mean low quality administration and there are a few purposes for such shoddy administrations. These organizations utilize modest techniques for SD CARDS duplication and consequently can offer their administrations at such low rates. CD Replication Scotland is a decent case for this. I too have a lot of issues with these usb dongles on BL460c gen9. From time to time the ESXi host “loose” the dongle. Powering the server off and on usually works. 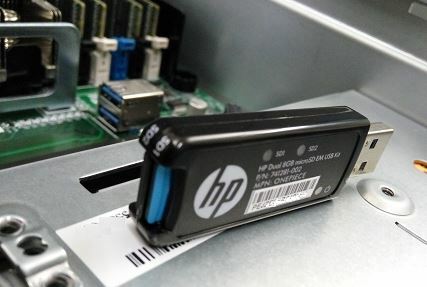 Seriously thinking of ripping all USB dongles out of the servers and use the internal sd-card reader… Case with HP have not given anything, they usually seem unaware about this dongle. same issue here as Bjorn. Had HP troubleshoot the issues. Upgraded all sorts of firmware etc. 10 months later they ended up shipping regular USB sticks as a replacement. No compensation for the time and money spent on these pieces of junk. After applying Service Pack SPP2016.10 for ProLiant, the issues with the SD’s seems to be significant better. Since the upgrade they run stable. Sounds good, I have planned to install that one asap. However, I pretty fed up with this issue. Every time it occurs, I pull the usb dongle and just put the microSD card in the built-in slot reader instead. Read in some other thread that a others have migrated from HP Dual microSD USB kit to on-board reader with a huge amount of hosts and never had a single SD card failed. Going with that too. Hallo liebe Produkt-Entwickler von HP, das Teil ist wirklich das Letzte! Nicht zu empfehlen um einen ESXi Host davon zu booten. Wir haben massive Probleme mit dem Host bekommen, als dieser mal wieder das Bootdevice verlor. Der VMware Techniker erklärte mir, dass es ein grosses Problem sei mehr als ein USB Device dem ESXi-Server zu präsentieren. Scheinbar hat HP davon noch nichts mitbekommen, denn mit diesem USB-Stick werden gleich 3 LUNs präsentiert. is the RAID1 hardware-based or software-based?? That is, is the RAID1 configured in the USB dongle or is it programmed into the microSD cards?? 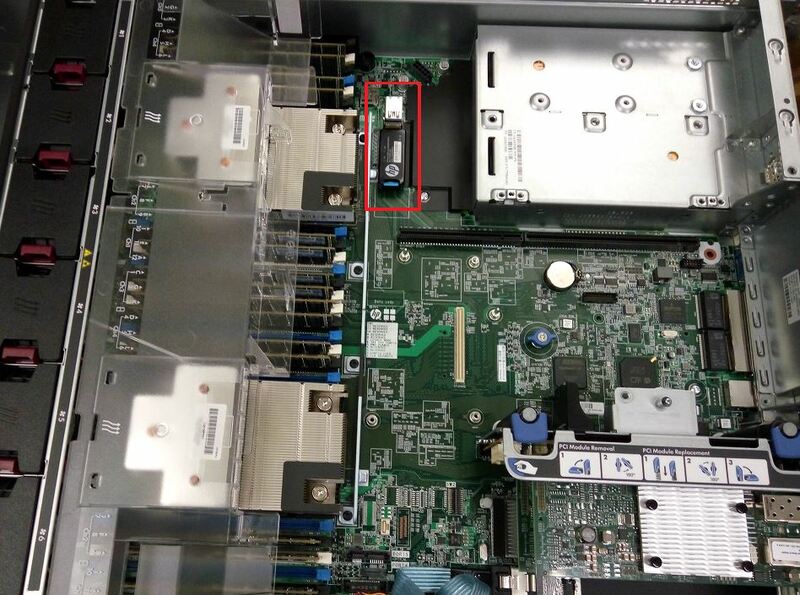 if i have now install on hp proliant gen 9 360 1 SD card on board with ESXI install and i bought the Dual SD card dongel can i place the 1 SD on the dongel and the Raid will be Build? or i need to install from clean SD? I installed ESXi 6.5 U1 on a 8GB HP branded SD card but a consultant recommended I use 2 HP USB drives in RAID 1 instead for redundancy. I had issues with PSOD with BIOS in UEFI mode. once I switched to Legacy mode the issue went away. Our 3 other hosts have the dual HP USB drives in them and they have been running for 4 years without any issues.